A while ago I came across a recipe for amaretto scallops that sounded really interesting. I like amaretto but I had never even thought about using it in a non-sweet dish like with seafood. 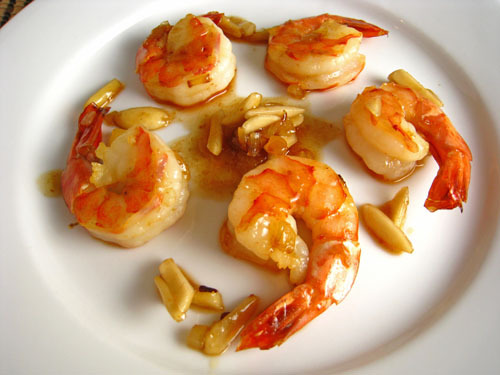 After a bit of searching I came across this recipe for almond shrimp with amaretto butter . I really liked the sound of the browned butter and almond sauce on shrimp and I just had to try it. This dish came together in almost no time at all. The amaretto shrimp was so good! I was a bit worried that the dish might be too sweet but it was nicely balanced and quite tasty. The slivered almonds added a nice contrasting texture and some extra almond flavour. 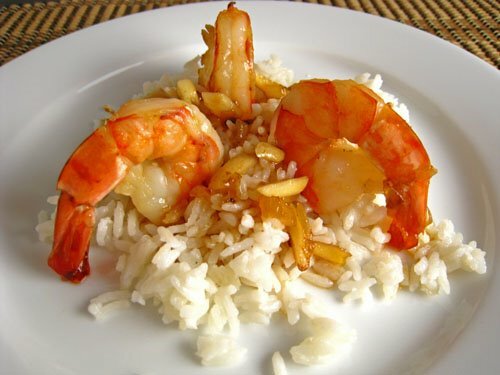 I served the amaretto shrimp on some coconut jasmine rice to soak up all of the buttered amaretto sauce. I can’t wait to make this again. Melt the butter in a pan and cook until golden brown. Add the onion and saute until they just start to brown. Add the shrimp and saute for 2-3 minutes. Add the amaretto, almonds and salt and saute for 2-3 minutes. What an interesting use of amaretto! Looks good, Kevin! Now I know what to do with the bottle of amaretto in my cabinet. Kevin, this looks fantastic! I love anything with amaretto in it. I am definitely bookmarking this one! WOW……I never thought of this combination before. This will definitely have to make an appearance at my next cocktail party. I love amaretto, but like you would never have thought to do it with a shrimp dish. Love it! This is the first time I heard of amaretto, what an interesting and delicious-looking recipe! Mmmmm what a great idea Kevin! Those shrimps look fantastic! Hey I’m glad you liked the scallops! I’m going to try using it with the shrimps too. Kevin, you come up with absolutely amazing meals! Amaretto is about my favorite. Another one of yours to add to my to-do list! What an unusual combination! And it looks easy, just what I’m looking for. This looks fantastic Kevin and what a great idea to use amaretto!! That’s one flavour combination I would have never thought of. Hmmm. . . interesting. I love almonds, so I will definitely think about this. Fantastic pics!! That looks SO good, Kevin! Great use of Amaretto. Oh, my gosh, Kevin that looks delicious! I love shrimp and to pair them with amaretto is so creative! amaretto??? blimey. i’d have that please. Wow! What an interesting idea to combine Amaretto with Shrimp! I love it! looks so yummy! Good find Kevin, Helen’s blog is a chalk-full of good grub. I think amaretto is one of the greatest ingredients out there. These shrimp certainly look and sound delicious. I must try them! What a great combo Kevin! I have a nice bottle of Amaretto sitting in my pantry!! Yum! I have a amaretto chicken that I make but the shrimp look extra delish. I’m sorry Kevin, but only 6 prawns per serving…..that will just not do. Lovely combination of flavors. Oh wow, how interesting! I also use amaretto only for desserts. But I’m guessing it must add a really interesting dimension to the shrimps! I have never had amaretto in a savory dish either. Sounds delicious! Kevin, I have to say that I absolutely ADORE!! your blog. Thank you so much! The recipes are very much in line with my tastes, and time you take to photograph and present each creation so well makes all the difference! Yumm, yumm, yumm. I am making the amaretto shrimp tonight. …from a fan on a Caribbean isle. Kevin…I completely agree with you on this interesting Amaretto dish. I like it so much that I will be making it part of a round-up list to go with my post this coming Monday. Hemingways in Providence, RI serves coconut shrimp with an Amaretto dipping sauce… Soooo good!